Calcium occurs throughout the entire plant. It is used for many processes in the plant, however, calcium is most important for the growth process. It has a regulating effect in the cells and contributes to the stability of the plant. Plants have two transportation systems at their disposal: the xylem vessels and the sieve vessels. Most nutrients can be transported via both systems, however, for calcium this is not possible. Since calcium can be transported almost exclusively via the xylem vessels, it is an element that deposes of little mobility within the plant. It is, therefore, important that a sufficient amount of calcium is always available in the root environment, so that it will be continuously available for absorption by the plant. Calcium is important to the growth process. Has a regulating effect in the cells and contributes to the stability of the plant. Yellow/brown spots, surrounded by a sharp brown outlined edge. Add calcium by applying a liquid lime fertilizer such as a calcium nitrate solution. The older, larger leaves just above the bottommost ones will show the first symptoms. Yellow/brown spots occur, which are often surrounded by a sharp brown outlined edge. In addition, the growth is curbed and in serious cases the tops are smaller than normal and do not close. The symptoms often appear quickly; within one or two weeks the first spots being visible on the older leaves. The spots usually start as small, light brown specks that increase in size over time. After two weeks, the older leaves show ever increasing spots and the spots also often appear at the edge of the leaves, as with a potassium deficiency or with scorch symptoms. The spots have a sharp outline and do not originate exclusively at the edge of the leaves. A lag in development is often already noticeable within a week. 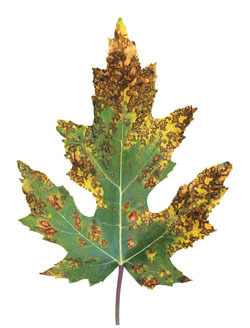 The older leaves die off slowly and yellowish cloudy spots may appear around the necrotic spots. The older the leaf is, the more serious the symptoms are. The flowering is also hindered and slowed down. Fruits stay small. Culture on calcium fixing potting mix. An excessive amount of ammonium, potassium, magnesium and/ or sodium in the root environment. The absorption is curbed mostly by ammonium and least by sodium. Problems with the evaporation caused by an excessively high EC value or by excessively high or low relative humidity. If the EC value of the substrate or the potting mix is too high, it can be easily rinsed out with pure and if necessary acidified water. Additional calcium can be applied through the nutrient solution by means of liquid lime fertilizers such as a calcium nitrate solution. With an excessively acidic potting mix, lime milk can be used to increase the pH. Use the appropriate potting mix that is not too acidic. Acid potting mix often contains insufficient amounts of lime. Good potting mix and Coco substrates are already limed. For your information: Be careful with fertilizers containing chloride.